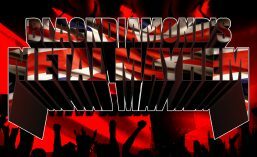 Blackdiamond’s Metal Mayhem on Tuesday 29th January is as always from 6PM GMT for two hours on http://www.totalrock.com. Listeners on mobile devices should still be able to listen via the TotalRock player, or the TuneIn Radio app can be downloaded. My special guest this week for his first ever UK interview is bassist Alex Pickard, from US metal bands THE THREE TREMORS, CAGE and MONARCH, who will be discussing all the latest news and more! The main focus of tracks will be from THE THREE TREMORS, as their self titled debut album has recently been released in Europe, via Steel Cartel Records. The album and all their news is available from the band’s official website at this location. Also coming up on the show – the latest from FALLUJAH, AVANTASIA and ICY STEEL, plus the META(L)SCOPE will feature three tracks from Herman Frank‘s forthcoming album “Fight The Fear”! This entry was posted in News and tagged "Fight The Fear", Alex Pickard, Blackdiamond's Metal Mayhem, Herman Frank, META(L)SCOPE, The Three Tremors, TotalRock. Bookmark the permalink.